Epic | Beer Apprentice - Craft Beer News, Reviews, Interviews and Info. Hello everyone. For today’s craft beer review I’m going to be drinking the Epic Barleywine Release #2 brewed by the Epic Brewing Company located in Salt Lake City, Utah. This will only be my second Epic beer ever. I tried the Big Bad Baptist earlier in the Spring and absolutely loved it, so I have high hopes for this brew. Let’s see if we can find some information regarding this brew from the website, epicbrewing.com. The first sip of this brilliant, red-brown beer reveals a robust mouth feel and complex flavors including raisin, dark bread, some sherry flavors sure to increase with age. With the finish comes the flavor of Columbus hops followed by the alcohol warmth that can be felt down your throat. This beer comes in a 22 oz. bomber and it contained an ABV of 10.1%. The beer poured a caramel/brown color with an off white head. It was sized nicely, mostly smooth and creamy. The retention time was adequate and the lacing was solid with a clear alcohol film left on the sides of the snifter. A solid aroma of caramel malt and dark toasted bread crusts. Satisfying piny and earthy hops along with some lighter citrus. A touch of fig too. It smelled quite sweet and sugary as well. Little to no alcohol was found in the nose, which I found surprising considering the relatively high ABV. Solid bouquet all around. The taste affirmed some sweet and sugary caramel/toffee malt. A fairly strong hop profile of orange citrus and earthy hops. Rather resiny also. Some toasted breads and dark fruits came through at the back end to help round off the flavor profile. I did find a little bit of alcohol in the taste, but it wasn’t overpowering or disturbing. The mouthfeel was medium bodied. Dry, sticky, chewy and smooth. The carbonation was of medium strength and just a touch of warmth was felt in the chest. A good bit of flavor was left behind after the swallow also. Overall, I thought this was a pretty good brew. It’s not quite as strong or robust as some other Barleywines out there, but it’s still rather tasty in my opinion. A dependable and sturdy representation of an American Barleywine. The alcohol was barely even noticeable and the hops were out front enough to aide in creating a relatively easy drinkability. I would have no problem trying this again, nor would I have any problem recommending this to any craft beer drinking friend. I think it would be better suited for the cooler weather, however I had no problem putting it down on the warm Summer night in which I tried it. 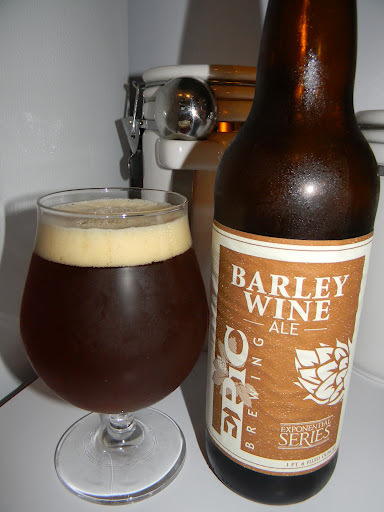 Have you guys ever tried the Epic Brewing Barleywine Release #2? What did you think? Feel free to leave a comment in you would like. Hi guys. For today’s craft beer review I’m going to be trying the Big Bad Baptist brewed by the Epic Brewing Company located in Salt Lake City, Utah. Once again, a big thanks to Adam Hudak and Stephanie Suratos (The HungryDuo) for supplying me with this brew. This will be my first time ever trying anything from Epic. 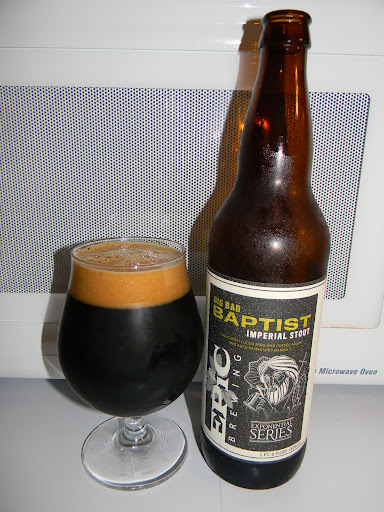 I have release #3 and from the website, epicbrewing.com, we find this information about the Big Bad Baptist. Brewed on August 22, 2011. Packaged on December 9th, 2011. This delicious coffee/chocolate nib laced beer shows slight hints of whiskey from the barrel aging. Pours an almost pitch black with auburn highlights. It has hints of dark chocolate, bourbon, dark fruits and vanilla oak. This beer is certainly going to keep you warm on a cold winter night. Sounds great even though Winter has long since past in my neck of the woods. Who cares though? Let’s get this thing in the snifter and see what it’s all about. This beer comes in a 22 oz. bottle and has an ABV of 11.4%. The Big Bad Baptist poured jet black with absolutely no highlights showing through whatsoever. The crown was dark tan, creamy, very smooth and tightly compacted. It formed to a good size with a very easy pour. The retention time was more than suitable and the lacing was nice and clingy. The clear alcohol legs were thick and sticky as well. Once the head finally did settle, it left a ring circling the top of the liquid. This beer looked great to say the least. The nose presented tons of heavily roasted espresso and coffee notes. Mild touches of chocolate with very light bits of whiskey. A good dose of woodiness started to come through as the brew warmed as well. Although the nose was somewhat simple, it smelled outstanding. One of the best and most solid bouquets that I’ve encountered in quite some time. The taste brought forth a lot of that roasted espresso/coffee bean character. The whiskey stepped it up a notch or two as well. The woodiness was polite, balanced and fitting, while a light relish of vanilla did become noticeable. The bittersweet chocolate helped tie everything together. The bitterness was of low to medium strength, which let me concentrate on those wonderful malts. A superb tasting beer. Harmonized and balanced exceptionally well. The mouthfeel was mostly full bodied. Very smooth, chewy, thick and viscous. The carbonation was great and a nice bit of warmth was felt at the back end and on into the belly. An exemplary amount of flavor drenched the palate long after each sip. Man!!!! This is one awesome beer!!!! I absolutely loved it. As I’ve mentioned before, these “Coffee” Stouts are one of my favorite styles and the Big Bad Baptist packed plenty of that roasted coffee aroma and flavor to more than satisfy me (and most anyone else for that matter). The whiskey and wood really compliment that roasted bean flavor. The look and drinkability were top notch as well. Even with an ABV of 11.4%, I didn’t have a problem at all in downing this entire bomber all by myself. I took my time however, because I really didn’t want the brew to come to an end. I enjoyed it that much. If you guys have the opportunity to try Epic Brewing’s Big Bad Baptist…. I would highly recommend it. Granted, it probably is more suited for cooler weather, but it can be easily handled as the weather warms. Be sure to let me know what you think when you sample it. I would really like to hear some other opinions.